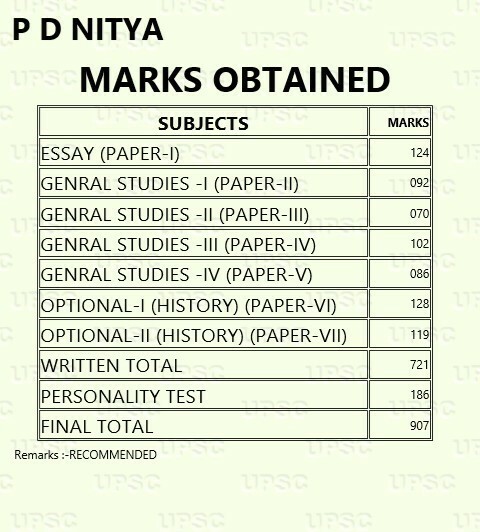 We are happy to share strategy and words of wisdom from PD Nitya – ranked 213. Friends,as you know her as one of our students in TLP program. Having seen all facets of IAS preparation from attending top notch coaching centres in Delhi to finding IASBaba HOT questions of TLP most useful Nitya is a rounded individual who can calibrate things as they stand. 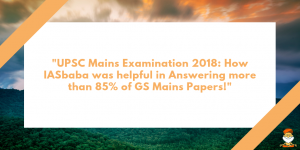 1) How did you come across the idea of writing UPSC Civil Services Examination? Since childhood I always wanted to do something different which none in my family has ever attempted and civil services being the toughest exam of India naturally attracted me. Also, i strongly believe that if right people are placed in the system then many problems can be resolved and civils is a great opportunity to do so. 2) Can you share a bit about your background? I come from a middle class family living in Bhilai, Chhattisgarh. My father is in railway contracting business, mother is a housewife and brother is an officer in Indian Navy.I did my Chemical engineering from NIT Raipur then worked for 2 years in ACC limited (Cement). In 2014 I resigned from my job and devoted my full time to upsc preparation. 3) How do you corelate your graduation degree, work experience and entry into civil services? My graduation in Chemical engineering deeply involves study industrial applications, problems of manufacturing sectors, cost optimization and ofcourse environment sustainability. Working in a core sector (Cement industry) and that too in a remote location (Chandrapur, Mah), gave me the opportunity to understand the ground realities better. My workplace was challenging as we were the first batch of female production managers to ever work inside the cement plant so naturally we were expected to be mentally tough. The conditions of Vidarbha region was also an eye opener like how the cotton farming there ruined the farmers with increasing debt. All these factors motivated and helped me in the preparation of civil services. The importance of governance and its reach is even more significant for the poor and rather being idealist, pragmatic solutions for problems were needed. 4) Now that Paper-2 of Prelims is qualifying. What is your approach for Prelims Paper-1? The changed pattern for Prelims has given more weightage to paper 1. I first started with revising all the basics (static portion) like history, geography, polity, art and culture from sources one has already read. Apart from NCERTs. CCRT helped to cover art and culture portion. Also, revision of newspaper and important current events is a must. Nowadays many sources can be found that compile current events monthly, this can be a lot of help. For environment and economy following current affairs helps but its basics should also be revised regularly as questions in prelims tests basic understanding of the topic rather than asking big figures or statistics. I also undertook tests periodically to judge my preparation. Its good to solve as many MCQs as possible as it helps to develop confidence and to self analyse the grey areas of preparation. 5) How was IASbaba helpful in your preparation? 6) Do you agree that smart work is the key to crack this examination rather than cramming all the books available in the market and slogging for hours? Yes, ofcourse, smart work is the need of the hour. As the syllabus of the examination is vast, its important that one should first understand the demand of the examination. Cramming all the data is of no use as UPSC is not so particular about your knowledge of data or that perfect definition written word by word from a renowned book. UPSC only wants to check your level of understanding. Even if you read only one book but have understood the topics well, you can fair well in the examination. So, put on hard work to understand the things and try to remember it by correlating with other aspects by developing a holistic approach. 7) GS-2 and GS-3 Mains is mostly Current Affairs? What was your approach for these two papers? What would you suggest to 2016 aspirants? For GS2 and GS3 read extensively The Hindu or The Indian Express (thats what I followed). If possible prepare your own notes and revise the events that happened. Since it is a very dynamic segment, one can retain much information by regularly writing answers. As IASbaba covers questions based on current events, practicing those questions actually boosts the memory power. In short, I would suggest read newspapers regularly and attempt questions based on it. 9) We started IASbaba so as to reach the rural aspirants across the country who cannot afford good coaching and still get a rank? Do you think we are on the right path in achieving that? 1. The recently concluded assembly elections portrayed a sorry picture of democracy where cash and kind dominated the electoral narrative. Critically comment.